The First Catholic Old Testament in English — Once Owned by an “Unfit” Reader?!? (Rather Unnerving Evidence of Readership) Bible. O.T. English. Douai. 1609–10. The Holie Bible faithfully translated into English, out of the authentical Latin. Diligently conferred with the Hebrew, Greeke, and other editions in divers languages. With arguments of the bookes, and chapters: annotations: tables: and other helpes, for better understanding of the text: for discoverie of corruptions in some late translations: and for clearing controversies in religion. By the English College of Doway. Doway: Laurence Kellam, 1609–10. 4to (I: 22.3 cm, 8.75"; II: 21 cm, 8.3"). 2 vols. I: , 1115,  pp. (5 leaves supplied). II: 1124, [2 (errata)] pp. (5 leaves in facsimile).  First edition of the first Catholic Old Testament in English — editio princeps of the Douai (or Douay, or Doway) Old Testament, half of what is commonly known as the Douai–Rheims Bible. The New Testament first appeared at Rheims in 1582; at that time the Old Testament was said to be ready for printing, but its actual publication was delayed until 1609 due to lack of funds. Both portions were translated from the Latin Vulgate mainly by Gregory Martin (with the intensely controversial Old Testament notes done by Thomas Worthington), under the supervision of Cardinal William Allen at Douai, the center of English Catholicism in exile during Elizabeth's reimposition of Protestantism. This translation is important for all, not just Catholics, as an enduringly influential milestone in Bible history. One of the foundational works in any collection of Bibles and Testaments. Evidence of Readership / Provenance: Vol. I front free endpaper with early inked inscription: “Cloister of Nazareth”; pastedown with inscription in a different hand, reading “The holy Bible some pages cut out, (for modesty's sake) thro' ignorance yt. each word hear in [sic] is sacred, & too sacred for such, as finds thmselves unfit to read it.” Vol. II front pastedown inscribed “Men have many faults / Women have but two / Nothing wright thay say / Nothing good they doo” [sic], signed by the Rev. Folkins of Derbyshire, dated MDCCCX; back pastedown with inked inscription of John Caldwell and pencilled inscription of Thomas R. Kilching. Handsome KJV with Genealogies & Psalms Bible. English. Authorized (i.e., “King James Version”). 1632. The Holy Bible conteyning the Old Testament and the New. London: Robert Barker...by the assignes of John Bill, 1632. Folio (34 cm, 13.4"). , 507,  ff. (lacking 7 prelim. ff.).  [preceded by] Speed, John. The genealogies recorded in the Sacred Scriptures, according to euery familie and tribe. [London: F. Kingston, 1632?]. Folio. , 34 pp. [with] Bible. O.T. Psalms. English. Sternhold & Hopkins. 1632. The whole booke of Psalmes. Collected into English meeter.... London: Pr. by R. Badger for the Co. of Stationers, 1632. Folio. , 114 pp. (lacking 8 index pp.). Attractive folio King James Bible, set in roman in double columns ruled in red throughout, with woodcut headpieces and decorative capitals. Darlow and Moule suggest that this edition was actually printed in early 1633, as a number of copies are recorded as having their title-page dates altered by hand to read 1633, as is the case here. The Apocrypha are present, with the blank space on the last page of Malachi filled with an early inked “account of the several books in the Apocrypha.” The Psalter following the Bible includes music. The O.T. title-page is engraved and signed (very faintly in this example) by William (here “Guilielmus”) Hole, and is framed by an elaborate architectural border displaying the coats of arms of the 12 tribes of Israel and portraits of the 12 Apostles. The recto of the list of books is a full-page engraving of Adam and Eve in the Garden of Eden, surrounded by animals. The New Testament has a separate title-page, dated 1632, with an ornate wood-engraved border featuring Justice and Truth along with the British lion and unicorn and various architectural motifs. The volume opens with two fly-leaves bearing genealogical records in several different early inked hands, with dates ranging from 1743 through 1847. A copy of Speed's Genealogies precedes the Old Testament, while the “Description of Canaan” with map that should close the Genealogies has been bound in after the O.T. title-page. Fulke's Refutation — THE ENGLISH CATHOLIC BIBLE Bible. N.T. English. Rheims–Bishops' version. 1633. The text of the New Testament of Iesus Christ, translated out of the vulgar Latine by the Papists of the traiterous Seminarie at Rhemes ... Whereunto is added the translation out of the original Greeke, commonly used in the Church of England. London: Pr. by Augustine Mathewes on[e] of the assignes of Hester Ogden, 1633. Folio (33.3 cm, 13.25"). Frontis., engr. t.-p., , 912, , 25, , 206, , 17, [1 (blank)] pp.  When the Jesuit scholars at Rheims succeeded in printing their Catholic translation of the New Testament into English (first edition, 1582), the event affected various English Protestant scholars in different ways: Some were offended or outraged, others intrigued, and yet others spurred to action. William Fulke, of Pembroke College, Cambridge, was among those offended, outraged, and spurred: In 1589 he produced the first edition of his work attempting to refute the Rheims New Testament. His approach, however — which was to print the Rheims NT in parallel columns with the Bishops' NT (the then accepted version of the Church of England), supplying accompanying notes and explanations — had unforeseen consequences. As Darlow and Moule comment, “by printing the Rheims Testament in full, side by side with the Bishops' version, [Fulke] secured for the former a publicity which it would not otherwise have obtained, and was indirectly responsible for the marked influence which Rheims exerted on the Bible of 1611.” Alan Thomas elaborates by observing that “many a dignified or felicitous phrase was silently lifted by the editors of King James's Version, and thus passed into the language” (Great Books and Book Collectors, p. 108). This is the fourth edition, “wherein are many grosse absurdities corrected.” A portrait of William Fulke precedes the engraved title-page, both done by William Marshall. The Biblical text is followed (as issued) by Fulke's Defense of the Sincere and True Translation of the Holy Scriptures into the English Tongue, against the Manifold Cavils, Frivolous Quarrels, and Impudent Slanders of Gregorie Martin. First Folio Greek N.T. Printed in England Bible. N.T. Greek. 1642. Jesu Christi Domini Nostri Novum Testamentum, sive Novum Foedus, cujus Græco contextui respondent interpretationes duæ: una, vetus; altera, Theodori Bezæ.... Cantabrigiae: Ex officina Rogeri Danielis, 1642. Folio (37.5 cm, 14.5"). ,  ff., 766 (i.e., 764) pp.,  ff., 125, [1 (blank)] pp., , [1 (blank)] ff.  In 1565 Theodore Beza (1519–1605, also de Bèsze or Bèze), Calvin's chief assistant and successor as leader of his reform movement, first published his edition of the Greek New Testament with the Vulgate and his own Latin translation. For the edition of 1582, he revised his text based on the discovery of the important Codex Bezae (Codex D), a manuscript of the Gospels and Acts probably written in the 5th century and the principal witness to the Western textual tradition of the New Testament. Beza personally owned this codex and presented it to Cambridge University in 1581. This is the first folio edition of the Greek New Testament to be printed in England as well as the first Greek–Latin edition of Beza's New Testament to be printed there. It is also considered by the ODCC to be the best edition of Beza's Latin translation of the New Testament. The text is based on Beza's fourth (and last) edition of 1598 and includes his annotations. Joachim Camerarius's commentary on the New Testament is appended at the end with its own sectional title-page and pagination. Provenance: 1710 ownership signature of “R. Holde[----? ].” Later in the library of American collector Albert A. Howard, small booklabel (“AHA”) at rear. English Black Morocco, Gilt Extra Bible. English. Authorized (i.e., “King James Version”). 1648. The Holy Bible containing the Old Testament and the New. Newly translated out of the originall tongues, and with the former translations diligently compared and revised by his Majesties speciall command. London: Printed by John Field, 1648. 4to (23 cm; 9"). OT:  ff. NT:  ff. [bound with] Bible. O.T. Psalms. 1655. The whole book of Psalms: collected into English metre by Thomas Sternhold, John Hopkins, and others. Lonodn [sic]: Pr. for the Company of Stationers, 1655. 4to. f., 122 pp.,  ff.  Two issues occur of this Bible, this being the one without the engraver's name on the title-page and with the printer's name spelled out and not abbreviated; the issues are the same after the first two leaves. This copy is without the Apochrypha, but with the final two leaves of the 1655 Psalms, which leaves are lacking in some reported copies. Provenance: On blank leaf before Psalms, “William Ingram His Booke 1660.” Later in the Howell Bible Collection, Pacific School of Religion (properly released). 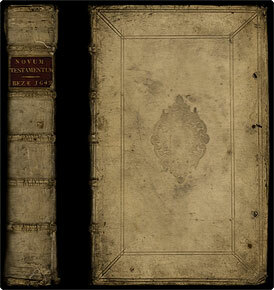 Binding: 18th-century black morocco, spine with raised bands. Gilt-tooled on covers with concentric frames incorporating foliate corner devices and particularly elegant, delicate side toolings; these last notably well complement the similarly refined tools used to compose the gilt-extra spine. Gilt rolls on turn-ins, French combed endpapers, all edges gilt. In Gothic & Anglo-Saxon & With an Extensive Glossary Bible. N.T. Gospels. Gothic. 1665. Quatuor D.N. Jesu Christi evangeliorum. Versiones perantiquae duae, Gothica scil. et Anglo-Saxonica. Dordrechti: Typis & sumptibus Junianis; Excudebant Henricus & Joannes Essaei, 1665. 4to (20.5 cm; 8"). 2 parts in 1 vol. ff., 565,  pp. ;  ff., 431 pp.  This is the first printing of the Gospels in Gothic and the second of them in Anglo-Saxon; it is also the first edition of Ulfila's Gothic version of the Gospels — based on the Codex Argenteus — parallel with the Anglo-Saxon version, which is based on the 1571 Day printing of the Anglo-Saxon Gospels. The presentation is double-column, with the Gothic to the left. The volume opens with a handsome architectural engraved title-page by A[braham Dircksz van] Santvoort (1624–69), featuring the four evangelists with their symbols and the tetragrammaton, preceding the typographic one. Thomas Marshall (1621–85) was the work's chief editor and later was rector of Lincoln College, Oxford. His assistant on the large project was François du John, the Younger, (1589–1677), whose Gothic–Latin dictionary with its own pagination ( ff., 431 pp.) and title-page — “Gothicum glossarium, quo pleraque Argentei Codicis vocabula explicantur ... praemittuntur ei Gothicum, Runicum, Anglo-Saxonicum, aliáque alphabeta. Operâ Francisci Junii” — follows the Gospels. Printed in England in 1665 & Bound in AMERICA in 1829 Bible. O.T. Greek. Septuagint. 1665. [four lines in Greek, then] Vetus testamentum graecum ex versione Septuaginta interpretum, juxta exemplar Vaticanum Romae editum. Cantabrigiae: Excusum per Joannem Field, 1665. 12mo (14 cm; 5.5"). f., 19, , 755 [i.e. 767, 1], 516 pp. (without the initial blank).